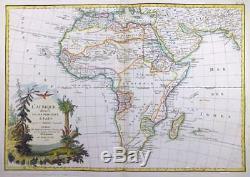 1762 - Original Decorative Antique Map of AFRICA AFRICAN CONTINENT by Janvier. A fine and rare original antique map titled. L'Afrique divisee en ses Principaux Etats. ATLAS MODERNE OU COLLECTION DE CARTES SUR TOUTES LES PARTIES DU GLOBE TERRESTRE c1775. A fine example of Jean Janvier's 1762 map of Africa. Janvier's map covers the entire continent of Africa as well as the island of Madagascar and adjacent parts of Europe, Arabia, and Persia. Like most 18th century maps of Africa, the present example is rife with speculation regarding the largely unexplored interior. What little was known of Africa, however, Janvier incorporates here in an impressive compilation of the most up to date reports from colonial, missionary, and exploratory. Into the interior of the continent. Thus well-mapped parts of the continent are limited to the Mediterranean Coast, Morocco, the Senegambia, the Congo, South Africa, the Kingdom of Monomatapa, Abyssinia, and Egypt. Morocco, Egypt, and the southern Mediterranean Coast (Barbary) were well known to Europeans since antiquity and Janvier's accurate mapping of these regions reflects continual contact. Further south the colonial enclaves along the Niger River (Senegal and Gambia), the Congo River, and South Africa reflect considerable detail associated with European penetration by traders and missionaries. The land of Monomopota around the Zambezi River was explored early in the 16th century by the Portuguese in hopes that the legendary gold mines supposedly found there would counterbalance the wealth flowing into Spain from the New Word. Unfortunately these mines, often associated with the Biblical kingdom of Ophir, were mostly tapped out by the 15th century. Abyssinia (modern day Ethiopia) was mapped in detail by early Italian missionaries and of considerable interest to Europeans first, because it was (and is) predominantly Christian; second, because it was a powerful well-organized and unified kingdom; and third because the sources of the Blue Nile were to be found here. The remainder of the continent remained largely speculative though Janvier rarely lets his imagination get the upper hand. He does however follow the well-established Ptolemaic model laid down in the. Regarding the sources of the White Nile here seen as two lakes at the base of the semi-apocryphal Mountains of the Moon. However, he also presents a curious network of interconnected rivers extending westward from the confused course of the White Nile following the popular 18th century speculation that the Nile may be connected to the Niger. To his credit Janvier does not advocate this and offers no true commerce between the two river systems. Lake Malawi appears in a long thin embryonic state that, though it had not yet been'discovered,' is remarkably accurate to form. Lake Malawi was not officially discovered until Portuguese trader Candido Jose da Costa Cardoso stumbled upon it in 1849 almost one hundred years following Janvier's presentation of the lake here. Janvier's inclusion of Lake Malawi is most likely a prescient interpretation of indigenous reports brought to Europe by 17th century Portuguese traders. Its form would be followed by subsequent cartographers well into the mid-19th century when the explorations of John Hanning Speke, David Livingstone, Richard Francis Burton and others would at last yield a detailed study of Africa's interior. Jean or Robert Janvier fl. 1746 - 1776 was a Paris based cartographer active in the mid to late 18th century. Janvier true first name is a matter of debate, as it appears as it often appears as either Jean or Robert. More commonly, Janvier simply signed his maps Signor Janvier. By the late 18th century Janvier seems to have been awarded the title of "Geographe Avec Privilege du Roi" and this designations appears on many of his latter maps. Janvier worked with many of the most prominent French, English and Italian map publishers of his day, including Faden, Lattre, Bonne, Santini, Zannoni, Delamarche, and Desnos. 1743 - 1793 was a Paris based bookseller, engraver, and map publisher active in the mid to late 18th century. Lattre published a large corpus of maps, globes, and atlases in conjunction with a number of other important French cartographic figures, including Janvier, Zannoni, Bonne and Delamarche. He is also known to have worked with other European cartographers such as William Faden of London and the Italian cartographer Santini. Paris court records indicate that Lattre brought charges against several other period map publishers, including fellow Frenchman Desnos and the Italian map engraver Zannoni, both of whom he accused of copying his work. Lattre's offices and bookshop were located at 20 rue St. Overall size of the map is 51cm x 39cm with large margins, perfect for mounting & framing CONDITION: Excellent overall condition with contemporary hand colouring and the usual centrefold, as issued. As would be expected with antique maps of nearly 250 years old, there will be some slight ageing and toning, but once mounted and framed, will not be noticable. ALL OUR PRINTS AND MAPS ARE ORIGINAL ANTIQUES AND ARE DATED AS STATED IN OUR DESCRIPTION. In some circumstances, we are able to accept a Cheque from UK Buyers, drawn on a UK Bank. We are very happy to combine many items for a single postal charge. All our items are sent in either Board Backed envelopes or Art Tubes and are in the case of sending to tropical areas of the world, additionally provded with sealed plastic envelopes. Antique Paper Company are established dealers in Antique Maps, Prints, Stamps, Postal History, Antiquarian Books and in fact all forms of Antique Paper also including Post Cards, Old Posters, Archives, Manuscripts, Ephemera etc. We work closely with Libraries & Solicitors/probate situations where they are looking for disposal options and seek better single items to large quantities and also Specialised Collections of almost any genre. Get Supersized Images & Free Image Hosting. Create your brand with Auctiva's. Attention Sellers - Get Templates Image Hosting, Scheduling at Auctiva. The item "1762 Original Decorative Antique Map of AFRICA AFRICAN CONTINENT by Janvier" is in sale since Tuesday, November 13, 2018. This item is in the category "Antiques\Maps, Atlases & Globes\Africa Maps". The seller is "antiquepapercompany" and is located in KENT.